There’s never a dull moment when Sagittarius and Aquarius are in love! With Aquarius’s innovative mind and Sagittarius’s penchant for travel, you never know where you’ll find these two zodiac signs! Fun loving Sagittarian adores the uniqueness of their Aquarian partner, and they often engage in intellectual sparring and a lot of witty banter. This stems from the fact that, at their core, Sagittarius and Aquarius soul mates are great friends. And when you add a romantic relationship into the mix, well that’s just icing on the cake! Here is the key to the success of the Sagittarius Aquarius love compatibility. Aquarius is a visionary and Sagittarius admires the groundbreaking knowledge and ideas they bring to the table. In fact, the archer is almost as impressed with the water bearer as they are with themselves! Think of a fireplace; what three elements do you need to keep a flame roaring and hot? You need air, fuel and a spark. Our air sign Aquarius provides the air, our fire sign Sagittarius provides the spark, and with the Aquarian’s never-ending stream of revolutionary thoughts and ideas as the fuel, this fire may never go out! Because Sagittarius is a mutable sign and Aquarius is a fixed sign, our flexible, unflappable archer has no problem conforming to the Aquarian schedule. They consider this part of the fun of their adventure, and they love a good adventure. Whatever imaginative, innovative journey Aquarius can cook up, Sagittarius is ready. One weekend, Aquarius might drop everything and take their Sagittarius love to the Monarch Butterfly Biosphere Reserve in Mexico and the next weekend these two might be in their own backyard stargazing and discussing astronomy. A Sagittarius dating an Aquarius is not jealous and both allow the other to have plenty of space if needed. Aquarius, especially, is not the clingy sort and needs plenty of time out with friends. And let me tell you, this Sagittarius Aquarius relationship has quite the circle of friends, too! Aquarius personality is the sign of friends and, boy, do they have a lot of them. And the key to being their friend is not how influential you are, but how interesting you are! The Aquarius man or Aquarius woman may befriend janitors, senators, theologians, and healers, as long as they’re original and ingenious thinkers. Aquarians love to pick the brains of interesting people. And this is fine by Sagittarius, who loves the influx of knowledge their friends bring to the table. Speaking of interesting and innovative, the Sagittarius and Aquarius in bed are definitely interesting and innovative! Their innovation can border on deviant, occasionally. You may find this couple handcuffed to the bed one moment and testing each position of the Kama Sutra the next. In this respect, as with every other, Aquarius is very cerebral, and he or she is thrilled that Sagittarius is open to any suggestion he or she cooks up. There is no limit to what the Sagittarius Aquarius sexuality might lead to. So, Sag, if you see your Aquarius lover come home with some rope, whipped cream and perhaps some duct tape, you know you’re in for a fun night! Aquarius, do you want someone who will drop everything to go on a spontaneous road trip to see the world’s largest ball of twine, discuss your (potentially opposing) positions of your favorite novel, then meet friends (yours of course) at a chakra healing convention? Then Sagittarius is the partner for you! Sagittarius, do you want someone who will show your adventure around every corner, from camping in the local state park, to cage-diving with shark, all the while surrounding you with endless, scintillating knowledge? Then Aquarius is the partner for you! Fortunately for the Sagittarius and Aquarius compatibility, the negative aspects of this horoscope match are relatively minor, if kept in check. And they both have to do with balancing needs and learning to beyond one’s own scope of thinking. Despite the fact that these two star signs really, genuinely like (and maybe even love) each other, their sense of self comes from very different places. Sagittarius is more concerned with his or her self, where Aquarius is concerned with the group. This doesn’t result in jealousy from the archer, who is too fixated on his or herself to even notice. However, it does result in Aquarius becoming disillusioned that the Sagittarian doesn’t share their passion for the bigger picture. Aquarius might be rescuing an injured sea turtle from a fisherman’s net, and Sagittarius may be staring at their reflection in the water! Sagittarius needs to take a step back from themselves and see the greater picture, if not for their own sake, but for their lover’s sake. There may also be some trouble with the Sagittarius Aquarius love compatibility in the bedroom, if issues aren’t addressed. As much as Aquarius is an innovator, he or she is also very cerebral. There is a definite disconnect between the brain and the body. They may get so wrapped up in thinking up and discussing a unique plan for their lover’s bedroom play, that they never actually, physically do it. According to our very tactile Sagittarian, what’s the fun of talking about the Kama Sutra, if you don’t give it a try? Aquarius needs to make an effort to connect with his or her body and be aware of his or her fiery lover’s virile sexual appetite. And trust me, Sagittarius will reward you for it! There is also the small (or not so small) issue of loyalty in the Sagittarius Aquarius marriage. As I’d mentioned, Aquarius is the sun sign of friends and expansion. So their concept of being loyal is very different than the Sagittarian’s concept of loyalty. In many cases, Aquarius believes that it’s okay to have extramarital relationships as long as they return to their lover. Because of the aforementioned mind/body disconnect, they truly believe that these dalliances mean nothing. They’re simply distracted by bright people and think nothing of following through with impulses, whatever those impulses may be. On the contrary, this burns the intensely loyal Sagittarius born to the core, because they only have eyes for their Aquarius love. And this can lead to a Sagittarius Aquarius breakup. The Water Bearer must learn to put their Sagittarius lover first, but that doesn’t mean your excitement has ended! If you include your partner in your escapades, they’ll definitely make room for threesomes…or maybe more! In order to avoid these relationship pitfalls, Sagittarius must refocus on the bigger picture instead of their own reflection and Aquarius needs to include their lover in all their fun. Remember, the archer doesn’t mind the many friends and multiple partners, as long as he or she remains your ever-present sun and the rest are just stars in the sky. 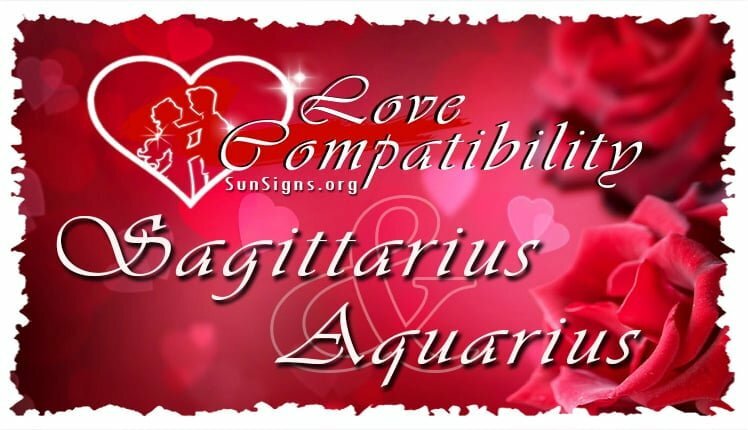 To conclude, Sagittarius Aquarius compatibility make an exciting and complementary match! Sagittarius lives for the spontaneity and innovation Aquarius brings to the table and the Aquarian loves the Sagittarian’s imperturbable nature and thirst for knowledge. However Sag, if you want to keep from annoying you Aquarian, don’t be distracted by your reflection in any shiny object you come across. Aquarius, be mindful that your Sagittarian comes first, in body and mind. Don’t be wholly distracted by the latest interesting being in your midst. If you can get past these obstacles, Sagittarius and Aquarius soul mates are incredibly well paired. And with all that Sagittarius and Aquarius in love bring to the table, prepare for a lifetime of knowledge and adventure!